The circle is considered a complete, perfect shape. 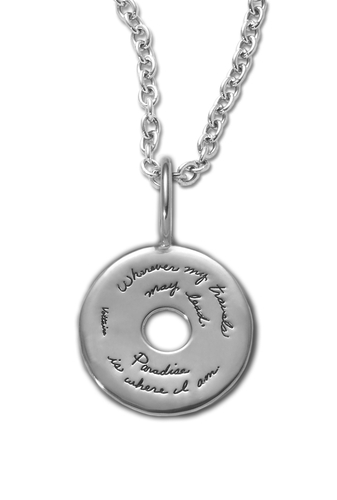 Let this shining circle of sterling silver remind you that wherever you are, you are complete. You hold the key to Paradise. That’s because Paradise is a state of mind. It’s an attitude of appreciation that allows you to embrace each moment as a gift. The philosopher Voltaire believed we should pursue freedom and enlightenment. This necklace reminds the wearer to enjoy the journey. It makes a beautiful gift for any occasion. Jo Becker’s distinctive script adds a special touch to this inspirational quote engraved on sterling silver. This motivational sterling silver necklace is available on an 18” sterling silver chain or an adjustable black cord.